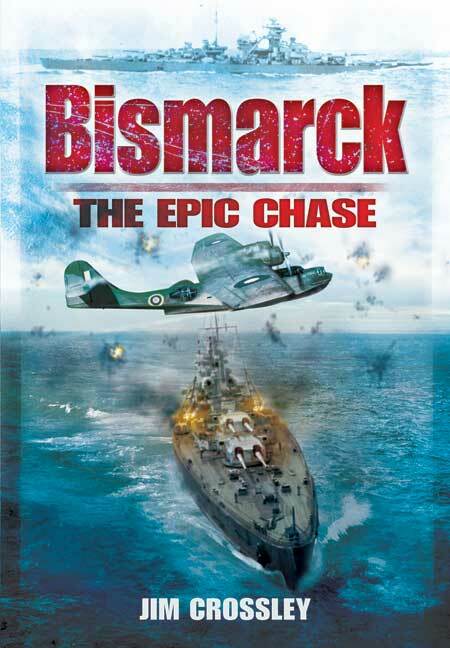 You'll be £19.99 closer to your next £10.00 credit when you purchase Bismarck: The Epic Chase. What's this? When the German Battleship Bismarck was commissioned in 1940 she was one of the fastest and most powerful ships afloat. To the Royal Navy and the security of Allied shipping in the Atlantic she posed an enormous threat – she must be destroyed. When she broke out into the Atlantic in 1941, some of Britain’s most powerful ships were sent to pursue and sink her. The first encounter proved disastrous for the British Battleship HMS Hood, which was sunk at 0800 on 24 May. Bismarck had sustained several hits from HMS Prince of Wales but the Royal Navy were unsure of the extent of the damage and whether she would attempt to return to Germany for major repairs or sail for France to lick her wounds. Previous written accounts suggest that the whereabouts and course of Bismarck were unknown to the Allies until discovered by an RAF Catalina at 1030 on 26 May. This was followed an hour later by the arrival of a Fairey Swordfish flying off HMS Ark Royal. This aircraft hit the Bismarck with her torpedo and severely damaged her steering gear. It was now only a matter of time before the full firepower of the British capital ships would close in and destroy Germany’s greatest ship. This new book revises previous theory of the events, in which earlier publications have failed to reveal the full extent of the capabilities of both British and German Radar or the significance of British ULTRA signal intercepts. …this is an excellent compilation and, if a single publication had to be chosen, the definitive account of the bookshelf. What crossley brings to the tale is a hard analytical look at the decisions, actions, and options usually missing in earlier works. Norfolk author Jim Crossley's compelling new study and penetrating analysis of this most celebrated of all British naval triumphs of the second world war makes it clear that the destruction of Hitler's greatest battleship in May, 1941 was far more them a propaganda victory and hugely influential to the out come of the maritime struggle not just in the Atlantic but in the Mediterranean. Crossley proves himself an accomplished narrator, able to marshal a mass of archival sources to great effect while steering a steady course illuminated by his interpretations of British intelligence decrypts and the invaluable contribution of shipboard radar. Through it all, he brings alive the human saga of courage and sacrifice on both sides that underpinned an epic of triumph and tragedy that encompassed the loss of the Hood, the shadowing role of HMS Norfolk, the critical and heroic attacks carried out by obsolete biplanes and the vital reconnaissance missions flown by RAF Coastal Command. Above all he manages to make sense of an often confusing and fast-changing naval odyssey across miles of Atlantic Ocean, exploring many a hoary myth along the way with the sharpest assessments I have read anywhere about the decisions and blunders which ultimately resulted in on the the Royal Navy's finest hours. Jim Crossley is a retired engineer and a keen sailor. He has a history degree from Cambridge and has previously written a novel Something Wrong with Our Ships and a book on early British destroyers to be published by Osprey. He lives in Norfolk.